sos pelo...tudo, o que te pasa que contestas? no y should i mind? thank you for emails but do you mind stopping sending the mails. You are invited to participate Road Safety Awareness. We request you send your contribution to the following Bank Account. Potato peas curry served with steamed scented rice or naan is enough to satisfying our taste buds. This creamy and yummy recipe takes few minutes to be cooked. Try it once and you will know that it tastes absolutely divine. A Vrat Thali basically includes food items for the devotees who keep fast. As during the fast it is compulsory to eat only Satvik food, there are limited options available for the fast-observers. Rogan josh was brought to Kashmir by the Mughals. It is an aromatic lamb dish hailing from Kashmir and is quite popular in the Indian sub-continent, Singapore and the United Kingdom. Rogan josh (or roghan josh), an aromatic lamb dish is the sine qua non of Kashmiri cushine. Enriched with the goodness of spinach and mushroom this is a tasty yet healthy salad recipe. This is a special dish for mushroom and spinach lovers. At the height of summer when the tomatoes are ripe and the cucumbers copious, this salad celebrates the season. To view this discussion on the web visit https://groups.google.com/d/msg/indian-food-recipes/-/JbwzzDxpt4gJ. In today's fast pace and hectic life, salads have become an inseparable part of Delhiites lifestyle. Health conscious people are giving more preference to organic and low calorie foods like salad. Who would not like to gorge on a crispy bite of lot of cheese with colourful vegetables? After eating a pizza you are bound to utter the 'yummy' word. Whether you are hungry or not, the mere mention of pizza easily makes you crave for one. This deliciousIndian recipe is also called shahi tukra .This is a mouth watering sindhi recipe and a great dessert for times when you are in hurry. Don't miss to devour on this royal dessert in this auspicious festival. Hot and sour soup is quick, delicious and Chinese cuisine inspired soup recipe. Dish out this appealing veg soup as a starter or appetizer. Hot and sour soup is a light meal which can be eaten any time of day. This homemade cream of mushroom soup is a quick and simple recipe which can prepared in 10 minutes. This soup has a rich and creamy texture makes everyone to fall in love with it. To view this discussion on the web visit https://groups.google.com/d/msg/indian-food-recipes/-/Y-qKiVqPUS4J. 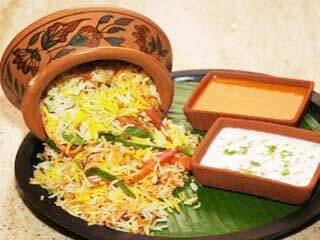 This Indian rice recipe made with long grained basmati rice and fresh vegetables is a perfect fit for your brunch. With delicate flavour of mint, saffron and Indian spices, this dinner recipe will surely tickle your tastebuds. Relish this rich Indian recipe with your beloved ones. A simple cauliflower curry with cayenne and cumin is something you crave for. A combination of Indian spices transforms this simple vegetable dish into a delight for the senses. This authentic Indian vegetarian recipe goes well with chapatti or rice. You can try this easy yet delicious recipe on any occasion. This healthy yet tasty recipe is perfect pick for your breakfast. Favourite of all and if served with raita than it is one meal dish. If you want you can add the fried onions and mixed vegetables in the filling. Make your Sunday morning more special with this easy recipe. To view this discussion on the web visit https://groups.google.com/d/msg/indian-food-recipes/-/TSDWUgT5qSYJ.